A solidarity stand was staged in Arnous square in Damascus on Saturday to denounce Trump’s decision on recognizing al-Quds (Jerusalem) as the capital of the Israeli occupation entity. 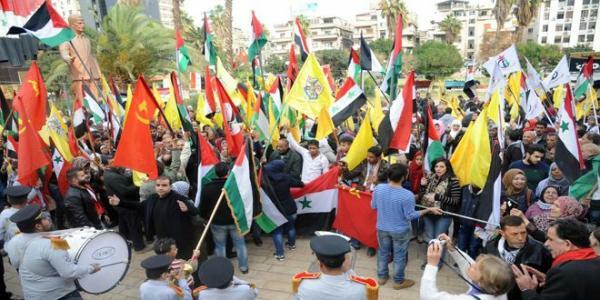 The Syrian Unified Communist Party and the Syrian and Palestinian national parties and forces organized the stand. The participants in the stand expressed their condemnation and rejection of the US decision, chanting slogans which reject the decision and warn of its repercussions on the region and the world. They also stressed that al-Quds will ever remain the capital of Palestine, stressing the need to confront the conspiracy hatched by imperialism, Zionism and Arab reactionary on al-Quds, Palestine and on the rights of the Arab nation. Secretary General of the Syrian Unified Communist Party, Hanin Nimr, said that the US decision on al-Quds is an aggression on the Palestinian people in particular, and the Arab peoples in general. A mass rally was also organized in Qatana in Damascus countryside in protest against the US President’s decision on al-Quds.